In Merritt Island NWR, riding along A. Max Brewer Memorial Pkwy always brings a lot of photo opportunity for raptors. 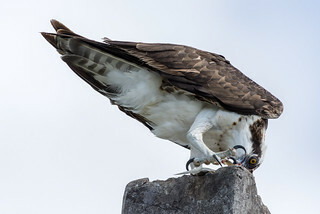 This osprey had just caught something good and was busy with it. I find it always special that these big birds don't seem to mind too much the flow of traffic down below their perch.